Difficulty – As always, the games difficulty has increased dramaticly, with an adjustable level curve. Wild Pokemon – Again, you will be able to capture all 386 Pokemon one way or another, a list of locations has been provided. Rivals & Rockets – You will notice that you have two extra companions to battle along the way. This includes May from the Hoenn Region and Jessie & James from Team Rocket! You will battle both of these several times throughout your journey. Extra Items – All those useful, unobtainable items that you couldn’t get are availble as gift items. This includes Lucky Egg, Silver Powder, Thick Club etc. A list of locations has been provided for these too. Stat Increases – A handful of Pokemon have had a suitible stat increase, this mainly applies to those with a lower Stat total. You can find all these on the Document with the download. Events – There is also a handful of events scattered around Kanto, this includes Gift Pokemon Events, Egg Events, Legendary events etc. Evolution – Obviously, the evolutions of the Pokemon with unaccessable methods of evolution have now been changed. 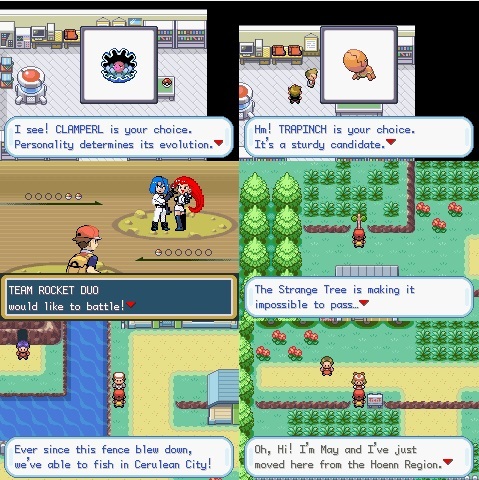 Gym Rematches – Since these were left out of FRLG, I decided to kinda create Gym Leader Rematches. These take place in a small building in Vermillion City which you can only access once becoming Champion! Familiar Faces – You will notice several Gym Leaders have been replaced with characters from different Regions! See if you can spot them all. Type & Gender Changes – Some Pokemon have had their Types and Gender changed, this applies to those who I feel needed them. Aesthetic Changes – A few Routes/Areas will have a slightly overhauled look, including entrances to new areas/caves. Attack Changes – Many of the Pokemon now have a more fitting and suitable moveset, this applies to atleast 200 Pokemon. I have also boosted the Power, PP and Accuracy of many Attacks such as Dig, Cut, Aerial Ace etc. Starters – Finally, I have rearranged the Starters to a more diverse mixture which is now Clamperl, Tyrogue and Trapinch. These share similar characteristics with each other which is why I chose these three. Why not the originals? This is because rather than having the generic set of Bulbasaur, Charmander and Squirtle, I thought it would be fun to change things up a bit and give you the opportunity to obtain a Pokemon that you can’t usually obtain that early on in the game. Besides, you will be able to get Bulbasaur, Charmander and Squirtle via events before the third Gym anyway.